The Corpus Areopagitum by Pseudo-Dionysus the Areopagite, dating from the early 6th century was highly valued by medieval theologians. The section on the angels, The Celestial Hierarchy, is what concerns us here. I think it’s fair to say that its influence on theologians was greater than that on artists, who had a somewhat take it or leave it attitude to the various angelic figures. Lowest tier: Principalities, Archangels and Angels. 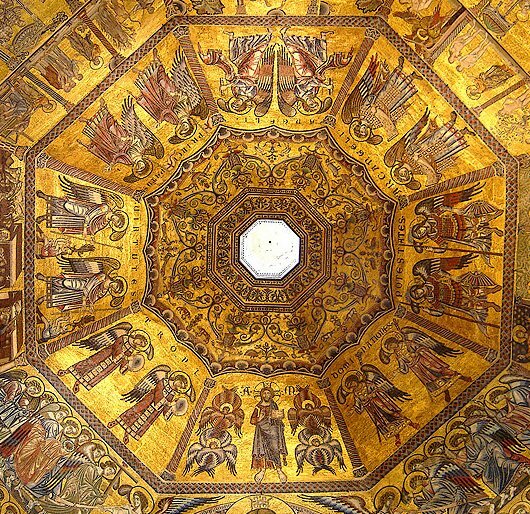 It is difficult to find a work of art that shows them all, but here is one: it's the dome of the baptistery in Florence. One problem for the mosaicists was that the arrangement of the dome presented them with eight sections, not the required nine: the solution was to put the most important of the angels together, next to the image of Christ. We'll look at the individual images in detail when looking at each of the orders.